Another day, another fight over the future of America’s space agency. Last week, committees in the House and Senate drafted bills that would govern NASA’s spending during Fiscal Year (FY) 2014 and beyond. Congress will spend the next few months reconciling these proposals into a single bill that President Obama can sign into law, as I described in my first astrobite on the federal budget process. Both of these bills fund NASA’s three main priorities: finishing the James Webb Space Telescope, partnering with commercial companies to deliver cargo and crew to the International Space Station, and building the Space Launch System and Multi-Purpose Crew Vehicle to enable human exploration beyond low-Earth orbit. However, these bills differ in several important respects from each other and from the President’s budget request, which was unveiled in April. Most obvious is the variation in total funding: President Obama asked for $17.7 billion and the Senate wants to appropriate $18 billion, but the House committee only authorized $16.8 billion. Of course, even the Senate’s relatively generous budget gives NASA less than 0.5% of the total federal budget. Beyond the $1+ billion differences in these top-line numbers, the House and Senate bills, passed basically on party line votes, lay out dueling visions for NASA’s future. In particular, the Senate endorsed NASA’s plan to capture an asteroid and bring it back for humans to study, but the House considers this a giant boondoggle. Why the different funding amounts? But not only did sequestration happen (oops! ), but many people want the across-the-board cuts to continue forever. Sequestration distresses fans of government-supported research (not to mention, say, public health or the military), but elates politicians who’ve advocated for drastic reductions in government since their election. That is, sequestration wasn’t a deadly threat, it’s exactly what certain people wanted. So, NASA is a leaf blowing in the political wind. The House only authorized $16.8 billion for NASA because they wanted to enshrine the sequestration cuts into permanent law. (They also gave Earth Science a serious haircut.) Still, many Republicans want more funding for their own parochial projects. For instance, Senator Richard Shelby (R-AL) wanted to fund the Space Launch System at $1.6 billion, instead of the $1.48 billion in the House’s bill, but he wanted the overall Senate bill to match the House at only $16.8 billion. Presumably, he would’ve rather cut something that isn’t manufactured in his state. What about this asteroid retrieval mission? Maybe you’re tired of the total war between Democrats and Republicans. Fortunately, the differences between the House and Senate bills aren’t entirely centered on the issue of how much to spend. There’s also a huge debate over NASA’s next big human spaceflight mission that’s relatively disconnected from traditional partisan politics. 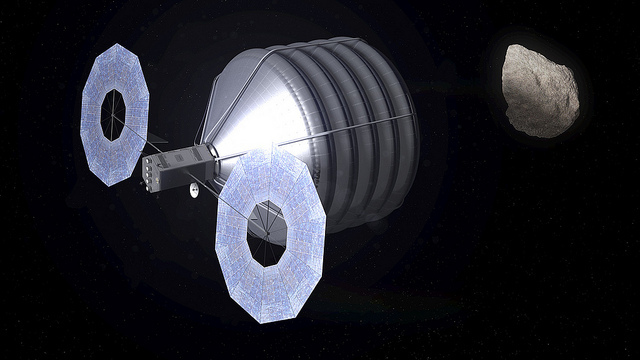 During the release of the President’s FY 2014 budget, NASA announced an ambitious mission to send humans to an asteroid. Actually, NASA wanted to bring the asteroid to the humans (see this cool video). A robotic spacecraft would go capture an asteroid that’s 7-10 meters in diameter and tow it back to the vicinity of our Moon, where astronauts would poke at it. This sounds like a super-cool mission, at least when you first hear about it. Turns out, there are several problems. First, NASA has no idea what asteroid they’d capture; these small targets are very difficult to find, especially since we need to pick one while it’s far away from Earth. Second, robotic sample return missions, like one (OSIRIS-REx) that’s launching in 2016, are vastly cheaper and probably return comparable science. Finally, a recent report from the National Research Council concluded that an asteroid retrieval mission has little support—not among the public or our international partners, and not even within NASA itself. With all these objections in mind, the House’s authorization bill bans NASA from developing an asteroid retrieval mission. It also prohibits NASA from looking for small asteroids that would be the target of such a mission unless they first find 90% of the larger asteroids that pose direct threats to Earth. The House wants NASA to focus on sending people to the Moon or Mars. These bills seem diametrically opposed, but there can be only one NASA Appropriations Act for 2014. They’ll have to be reconciled, eventually. Unfortunately, ongoing battles over fiscal cliffs, debt ceilings, sequestration, and the like will probably determine how much money NASA gets. We don’t know how committed NASA and the President are to an asteroid retrieval mission—whether they’ll fight to keep it or if they’ll bow to Congressional objections. Apologies, loyal readers, but I can’t tell you the future. No one knows what will happen.